Harry Mason is not having a good day. After crashing his car in a freak snowstorm, he wakes up to find his daughter missing with nary a trace. 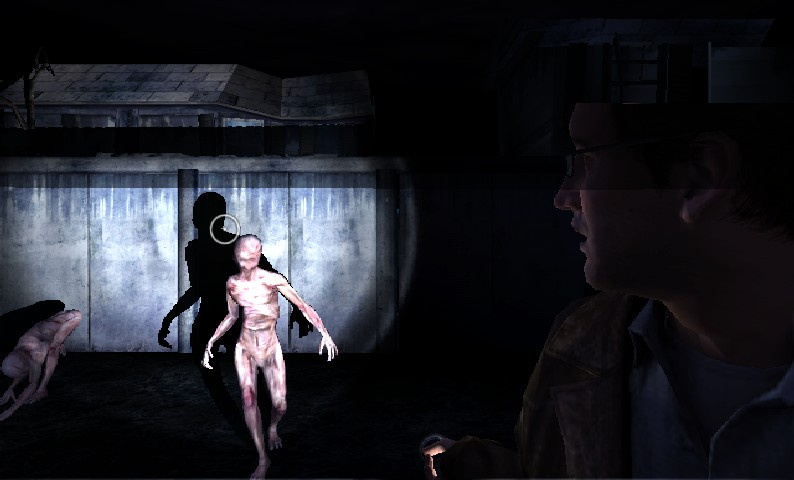 Determined to find her, Harry sets out into the night with a flashlight to explore the town of Silent Hill in this reimagining of the series’ original entry. Yes, reimagining, not remake. Silent Hill: Shattered Memories is not the same game as its 1999 PlayStation source. It retains signature elements of that game, sure: you’re Harry Mason, you’re looking for your daughter Cheryl in the town of Silent Hill, many of the original characters are included, etc. But Shattered Memories distinguishes itself by spinning a different yarn, stripping combat, trading rust for ice and tossing in some good ol’ psychology into the mix. The story touches on themes of regret, loss and sexuality through direct gameplay as well as through phone messages and images found in the world. It’s intriguing and Climax does a good job of baiting you with details so you’ll want to continue on just a smidgen more. Even if you know the original story inside-out by now, Shattered Memories goes down a different path so series vets won’t feel like they’re retreading old ground. We’d love to go into more detail but it would be a great disservice to those who plan on setting foot in Silent Hill. Shattered Memories tries to get into your head in a way no other game really has since Silicon Knight’s Eternal Darkness on GameCube. The much-publicised psychological test in the beginning of the game is personal and probing, wanting to know things like whether you make friends easily, need a drink to relax or even if you’ve ever been unfaithful to a partner. While your answers won’t significantly change how the story plays out, they do have a noticeable change on the world around you: for instance, police officer Cybil will look slightly different and be either receptive and helpful or untrusting and hostile depending on your answers. It sounds like a small change, but it does impact your perception of the supporting cast’s motives and can lead to mistrust and tension when someone appears. Similarly, enemy appearance will alter but not cause any behavioural changes. Periodically you’ll find yourself back with the psychologist, who will test you through moral dilemmas and image interpretation. Based on all this, by the end of the game you’re treated to one of five alternate endings and given a (surprisingly close) psychological evaluation. 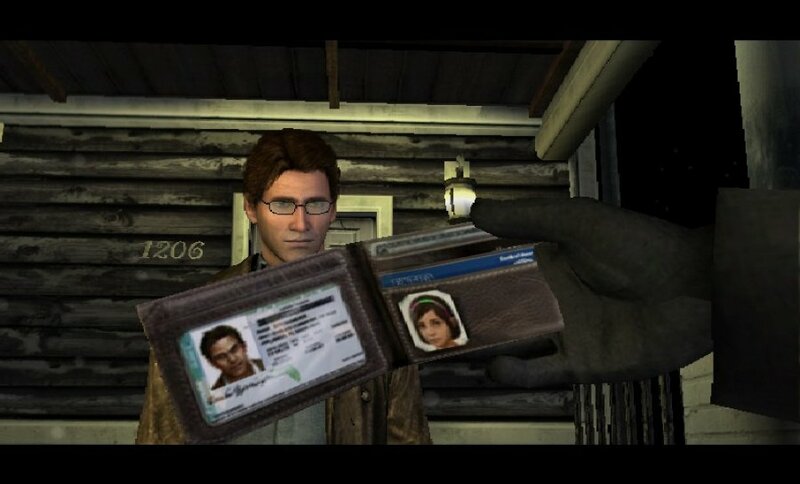 A significant addition to the Silent Hill formula is Harry’s cell phone, used to make and receive calls (you can dial any number found in the game with actual, albeit mostly brief, results), receive messages that advance the plot, take photos and access a GPS map. You can draw on the GPS screen to plot a route, which comes in handy when exploring outside of the dangerous ice world (also known as the Nightmare sequences). The phone feels very well integrated and is an indispensable tool for Harry. Climax’s decision to nix combat seemed questionable at first but ultimately proved to be a very wise choice for creating suspense; when the world ices over and the static amplifies, you don’t have the sense of empowerment that fighting gives, which causes you to feel more vulnerable and tense when enemies start running at you. You can throw enemies off if you’re grabbed, flares will keep them at bay, hiding in or under things will throw them off your trail and knocking over cabinets and lockers will impede them, but you can’t directly harm or stop them until the world thaws again – it can get pretty intense trying to reach the end of the Nightmares with creepies on your heel. The Nightmare sequences are ultimately the game’s biggest flaw. While well-implemented and spooky in their own right, monsters, and thus danger, only appear when the world is frosted over. 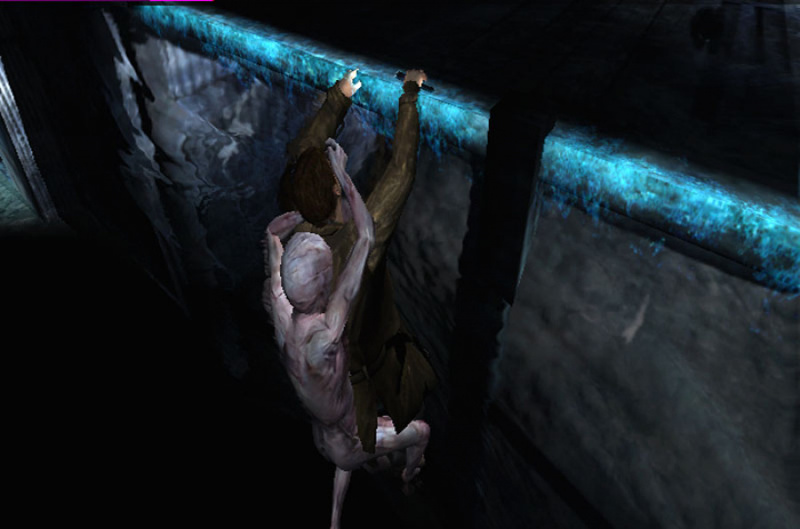 With just the one enemy type – as mentioned, the monsters can change their appearance but not their behavior – they can feel a little repetitive and far from the iconic design of past Silent Hill creatures. Another gripe is using the map in these sequences: oftentimes you have no idea how to reach the set waypoint when you’ve got baddies chasing you down, and slowing down for a quick check is often a bad idea. Escaping the Nightmares also tends to rely heavily on trial and error so you’ll find yourself retreading the same areas many times as you attempt to flee. 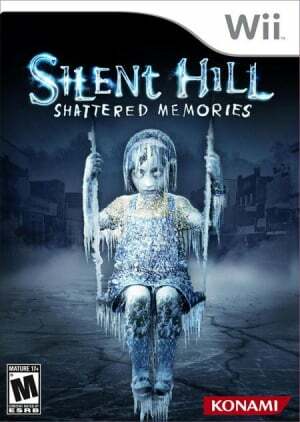 On the upside, Shattered Memories nails its atmosphere; the graphics are moody and realistic, some of the best on Wii in fact, and the use of sound to heighten tension is excellent. The constant falling snow strengthens the sense of cold isolation; those who usually get scared by horror games will likely meet similar results here. Harry’s flashlight casts accurate shadows over the game world and is probably one of the best implementations of a flashlight in any game. 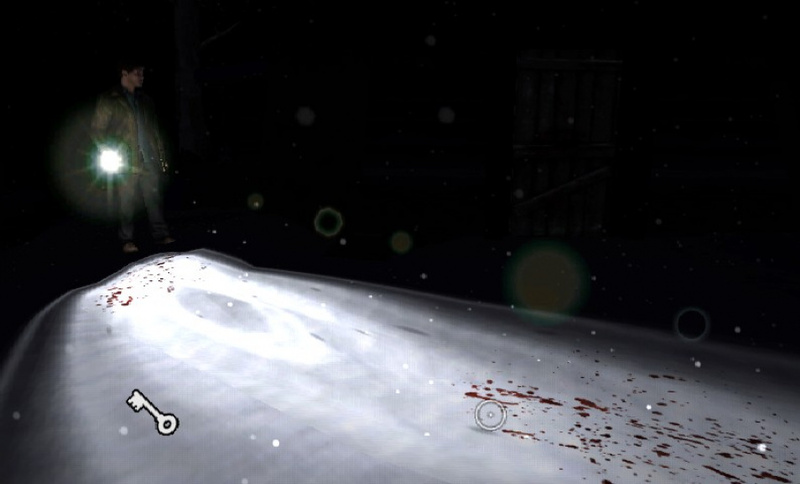 The flashlight is a shining example of Climax’s decision to build Shattered Memories from the ground up to take full advantage of the Wii’s unique feature set, even with PlayStation 2 and PSP ports in the pipeline. The game is among the notable few Wii releases to feature intelligent motion controls without resorting to tacked-on waggle. Object manipulation is done through pinching and on the Remote and twisting, turning and shaking. Throwing off an enemy or knocking down an obstacle is done by quickly moving the controllers to the side; on paper this may sound like dumb waggle but it makes perfect sense in context and feels natural. Phone calls come through the Remote speaker a la No More Heroes as well as the series’ trademark warning static. Even smaller touches, like the battery indicator on Harry’s cell phone matching the charge of the Remote, go a long way to sucking you into the mysterious town of Silent Hill. The adventure isn’t overly long - about five or six hours on your first playthrough - but with multiple endings there's decent enough incentive to hop back in. You can always change your psych test answers or explore the world differently and see where that takes you. 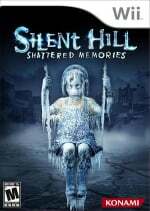 Whether you buy into the psychology bits or not, Silent Hill: Shattered Memories is still a great horror game on a console starved for them, yet is more remarkable for being a distinctly Wii game through-and-through. Play it for the atmosphere, play it for the suspense, play it for the story; we don’t care, just don’t miss out on one of the best Wii games this year. I'm so getting this game now. This will be the first Silent Hill game I've ever played. I really want this one. I haven't played the original on the PS, am I missing anything. I have a Playstation, but Silent Hill (and Klonoa) are extremely rare. Incredible game. It's honestly the first game in 25 years to make me tear up (probably due in part to being a relatively new father) and without a doubt one of the most engrossing gaming experiences of my life. It was such a long time since a game pulled me in like Shattered Memories that I was beginning to wonder if it was me--you know, if I had finally grown out of it. But once in a long while a game like this comes along and reminds you just what it is that makes this hobby so (potentially) rewarding. It's not perfect, but the core experience is so profoundly compelling that whether you play it for 5 hours or 50, Shattered Memories is bound to impact you in ways entirely unique to videogames and yet rare amongst them. Hmmmm.......Silent Hill or Darkside Chronicles? Definitely keen to get this; lovely review. Lots of good stuff coming in Europe in the 1st Qtr. 2010! @Sneaker13: The original Silent Hill can be downloaded on the PlayStation Network for the PS3. Although, I'm not sure if it's available in Europe. The original is about as scary as games get. I would recommend that game before this one. Shattered Memories is a joke and I can't believe this game got such a high score. This game is mediocre at best. It should've been called "Icy Ghost Adventure". Edit: OK, maybe I'm under-rating this game a bit, but I just expected more from this game. The fact that you are completely safe from danger outside of the Icy Ghost World kind of ruins the uneasy, heart pounding, I think I just crapped my pants a little bit feeling of the early games in the series. But I suppose if you haven't played a SH game before, then maybe you won't be let down. koopa85: Can we take it from this comment that you've actually played the game? I've never really liked horror games. But this seems more like a Psychological Thriller than a horror game. I love the fact that you're completely defenseless from the Zombie things; I've never understood the appeal of shoot 'em up Zombie games. I may very well get this, and it will be my first Silent Hill game! While I'll probably get the PSN one instead, I'd at least like to rent this version someday soon. It looks pretty cool for what it is. @KeeperBvK: Well yeah, I can't find it anywhere here. @koopa85: Unfortunately, I don't have a PS3. been so looking forward to this. now i'm justified in spending $50 on it, right? ....right????? Is funny how the nightmare scenes have received very mixed reviews..but I guess that's a good thing because it is unexpected and surprising. I want this game badly. X-Play gave it a 2/5 for "Repetitive Gameplay and Unscarry Scenes"
@ryanknight717: Cool story bro. I hear Nintendo Life gave it a 9/10, calling it a "great horror game." @Panda..... great in depth review my man. Great job. I have very fond memories of the original Silent Hill back in the day. PSone was decently new and the flashlight illuminating the sceneries very creepy and it was amazing for the times. Great to see it not just remade but reimagined and as a fan of the first game I would love to play thru this one, again though, great job on the review. @ryanknight..... Silent Hill is one of those games that is either loved or hated by gamers, I can honestly understand reviews being very different from one reviewer to the next. Wow a lot more positive than some of the other reviews I've read (no, not just IGNorant.) I have my fill of horror-themed Wii games with RE:DC and Dead Space Extraction but I think a space will open up for this at some point. I did so enjoy SH2 for PS2. Yeah, people here need to stop doing the IGNorant thing. It's not clever and makes the person sound petty. Wow, based on the comments, I can see the depressing sells already. At least I already have it. Too bad I can't play it until Christmas. @ryan A G4 review?? BWAHAHAHA!!!! Fox, I was wondering what part of making a pun of a website that some don't favor is petty? It's an opinion, just like the one you're apparently trying to push here. I thought the images and videos i saw were scary but my brother thoght it sucked (lol his exact words). I'm scared of little faceless people chasing me through an abandoned town! That part where hes in the closet and the little no-facer pops up and grabs him made my godson cry and I felt really bad because i laughed, woops. I really want to play this game. I've already beaten the game once and started a new game. You definitely won't be lost if you haven't played the original Silent Hill but at the same time know that this game isn't meant to replace the original Silent Hill in the canon. The game has its own place in the chronology and I really can't say anything more without giving anything away. If this is your first Silent Hill, its a great game. If you're a huge fan of the series then you will have strong feelings about this game. Good or bad, but strong emotions nonetheless. For those that think the series has gotten stagnant trying to repeat the same formula over and over again and thinks it needs something new to invigorate the series much in the way RE4 did for that series, then you'll probably love it. If you're one of those fans that thinks and forever will think Silent Hill 2 was the greatest game ever, then you'd do well to tread lightly. The game does not follow most of the conventions of a typical Silent Hill in either gameplay, storyline, or aesthetics. I personally loved the game. I felt the gameplay was unique, not just for the series but for video games in general. The story, while not sticking to the established conventions, is very human and relatable. The psychological profiling doesn't make it a completely different game every time, but there are probably more changes in the game than in other games with morality systems such as Mass Effect or Knights of the Old Republic. If you're an adventurous gamer, that is, you buy games beyond only what has a metacritic rating of 90% and higher, I urge you to at least play this game, be it purchase or rental, and see if its for you. There are few other experiences in video games similar to this and I hope it gets the attention and the appreciation it deserves. Not just in sales but in public perception. I need to get back to this game this weekend -- only have had a chance to put in an hour+ since i picked it up on release. Snowstorm's coming to NY and the northeast US, so perfect timing! Even in my limited time withg the game so far, i'm amazed at how excellent the total package is. Excellent mention of Eternal Darkness in the review; i was getting the same sort of vibe here. And i will continue to maintain that the game should be immediately shown to any developers who whine about the "underpowered" graphical abilities of the Wii. Side note -- Game Informer gave it a mediocre review, and reading the review i honestly thought that the reviewer must have been playing an entirely different game or an earlier build. Perhaps an interesting read for those who have played the game through, i think. Sweet. And regarding the xplay review, seriously, the guy and girl are as annoying as ignorance. I stopped watching them shortly after their debut years ago. Agreed, X-PLay's best time was the first year, maybe two. It's been a lot longer than that now. This looks awesome. Great review! 2nd highest rated Silent Hill game by Gamespot. Just behind Silent Hill 3. Silent Hill Shattered Memories is a great game and one of the best that I've played on the Wii this year. I have to agree with the icy nightmare sequences being the weak point. I don't find them particulary scary but they do inspire an 'oh crap' feeling as you know that you'll be running for your life soon. It isn't the longest game at around 6 hours but that is about the same length as the previous games in the series, so it is acceptable. I believe that it has quite a bit of replay value too, as your choices directly effect the game and there are 5 different possible endings. While there is room for improvement there is nothing that is really game breaking and if Climax could build on what they have created then a sequel could be something very special indeed. I would guess that you would need to be a bit thoughtful to get the most enjoyment out of Silent Hill as it is heavily based around the story and atmosphere, meaning that the scares are as much in your mind as they are on the screen. If you want an action packed game where you blast monsters with machine guns then this isn't it but if you are interested in a true survival horror game then this is one of the best around. ok, so from the perspective of what i have heard and being a silent hill addict. i am having mixed feelings, for 1 wii, i have found has had a horrible time trying to bring out games that intirest me, it seems as though all the great games like Left4Dead and such are going to the other consols, to be honest i would have been very disappointed if we had lost silent hill to them as well, so that is my main thought as someone who is trying to remain loyal to wii, seriously kudos to bringing a well known name to the system. OK onto my next thought Silent Hill to me is a game that i liked for the awsome creepyness of, the puzzles and the low amount of combat. the fact that they took the gunplay away makes me a little dissapointed cause everyone likes a good critical shot to the head once in a while, but in the past with SH games it almost seemed.... needless? i have never played a game like the way they have it layed out in the new SH, i am kind of intirested, i have a feeling the boyfriend wont like it due to the fact that he wouldnt be able to use our many wii guns with it. the other thought i have about it is.... it should be cheeper! i am running the cost through my head and am trying hard to justify it... my poor heart is torn. thanks for the reviews guys and perhaps as i read on i can make a decision. Oh, I say! I must get this! 9/10? It's a must. Excellent review, by the way. X-play's review score for this game means nothing. I am about 3 hours into this game and glad to say Climax studios has breathed new life into Silent Hill. I was skeptical of trading in rust for ice, but this game still maintains the psychological terror from past SH games. Snow is the new scary. To be honest most people complained that the past SH games combat felt clunky, so I find the nightmare sequences to innovative and very intense. You just never know when they will start. I agree with the review score 9/10 and hope the we see more Silent Hill from Climax studios. @Pcob, I think that the Wii controls are perfect for this game, in fact it's one of the best games I've ever played on the Wii - I would think that playing it with a 'normal' console controller would actually subtract from the game. The only fault with this game is that it's very short, but still well worth playing. 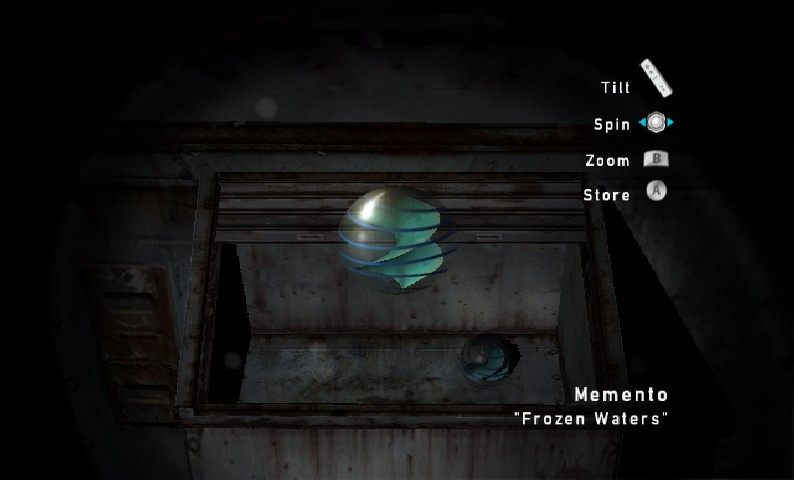 First of all the game is on the PS2 and PSP and it does not allow you to move your flashlight all over the environments. The fact is the Wii version is the best version due to the superb use of the Wii remote. This is one game where I would discourage the use of a guide. Its much better to be surprised by the icy nightmares then to know when to expect them. Played through the game - outstanding. Its 'flaws' are far surpassed by its narrative, originality and atmosphere. But the enemies just arent scary...or messed up and imaginitive as the previous freak shows in the other Silent Hill games. The nightmare sequences(I've only been through one) are annoying if you ask me, yet still intense. You have no idea where you're going running through doors, because you have no time to check your map because those little creatures are running after you resulting in trial and error based on where you're supposed to go. And what's the point of hiding in these closets when those enemies find you moments later? Honestly, they should of added combat instead of just running....Yes the combat is clunky in previous silent hill games, but this is the Wii were talking. IR Controls for combat would be fantastic as seen in Resident Evil 4: Wii Edition. I liked the lack of combat, something new - whole game is more psychological, I thought bashing the enemies wouldn't make sense in this one myself. Call me crazy, but I prefer this to two! Know what you mean about trial and error though, bit frustrating and detracts from the atmosphere. If you're only two hours in, the 'best' nightmares may be yet to come! Its a great Game . I love it. I bought it Friday and now i have play it through 2 Times. A very great game. If you don't buy it, you're missing out on a lot. The story is very complex and touching, as all Silent Hill games. The soundtrack is one of the best in the series, my favorite being Akira and Mary's cover of Always on my Mind, tied with Acceptance. There's a lot of controversy among fans. Realize that THIS IS A REIMAGINED AND RETOLD version of the first game. It is NOT A REMAKE. (Emphasis on that). This is also told in an ALTERNATE Silent Hill universe. This should be your fourth game. The order I would play the games are, (Related to the Cult: 1, 3, Origins, Homecoming), and then, (Related to personal storylines: 2, 4, then Shattered Memories). Or, you could reverse the order. Also, it's not an Icy Frozen World. It's called the OtherWorld, even though it wasn't necessarily manifested in the game. Play the first game and you'll understand. As with each Silent Hill game, there is heavy symbolism and reading to do to fully understand the game. Finally, as I said, you ABSOLUTELY vave to play this game, and Silent Hill 2. They both have the best storylines in video game history. Short, but very very satisfying. The music as always by Akira is amazing. Why not direct-port Silent Hill 2 & 3 on one Wii disc Konami? I like this game, except it's in no way scary, until you memorize the levels you will never know where you are or where you're going. So much replay value, I'm into it now 13 times. Been wanting this game for some time now, and I saw that it finally hit that sweet-spot when it comes to pricing ($20 new at Gamestop.) Gonna pick it up tonight, can't wait, seems really interesting! Just burst through Silent Hill in less than 7 hours in one playthrough. TRULY one amazing game that really got under my skin. I started a second playthrough and depending on how you answer all the questions and how you play the game it REALLY changes, and I mean REALLY REALLY changes. Locations, characters, dialog, scenery, design of the monsters and whole actions and cutscenes all change. I believe that NOBODY actually get the same "game" as someone else. An amazing feat by the creators of this game. I am very impressed what they have done here. Highly recommended !!! One of my favorite Wii games, and easily the most well-rounded, engrossing, and original "horror" game I've ever played. Just ended it. I have to agree with the others - great and truly unique game. The story and the climate through the gameplay is awesome. Also the controls are really nice and intuitive. It is true that there is not much fighting, but we can fight in almost every nowadays game. What I want is a story with nice twists and climate. Here you'll get both (starting from the game's menu! ).